Like all pets, the best hamster food is formulated to meet the nutritional requirements of your pet. Dwarf and Golden hamsters eat the same diet. Diet plays a critical role in the lifespan (approximately 2 to 3 years) and health of your pet. While hamsters are largely vegetarians, they will on occasion eat insects and meat. A high quality hamster diet should be available for your pet to eat at all times. Most hamsters will eat much everyday, about 1 tablespoon of food. Hamsters will eat most food night. Note that tracking hamster dietary habits can be tricky since some hamsters like to hoard and hide food. 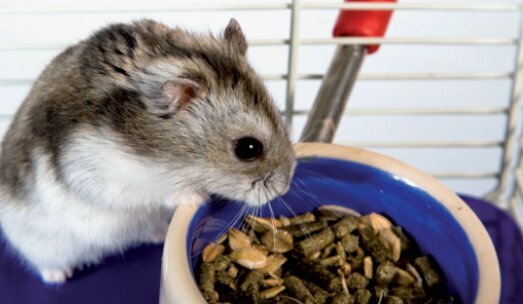 If you feed your hamster a variety or pellets and seeds, don't be surprised is the pet picks out favorites and neglects food that he or she doesn't like. Hamsters prefer seeds, so at minimum provide a mixture of seeds and pellets. Fresh water should be provided daily as well. All food dishes and water bottles need to be cleaned daily. Put out fresh food when it becomes dark out, about the time the hamsters wake up. The two basic types of hamster foods are seed and pellets. The problem with seeds alone is that they are high in fat and if fed as the sole food could lead to obesity. Look for pellets that contain approximately 15% to 25% protein. Do not provide pellets manufactured for other animals, only hamster feed. 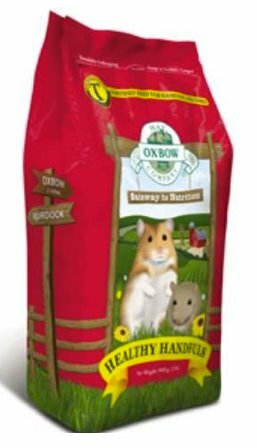 A good choice that meets hamster dietary requirements is Oxbow Healthy Handfuls. If has the recommended balance of protein. Remove any uneaten vegetables 4 hours after they are placed into the hamster cage. Do not overfeed vegetables to avoid stomach problems. Do not overfeed fruit since the hamster digestive tract does not tolerate fruit well. Do you have a question about hamster health or care? Ask and our Vet will answer it for free! Please be sure to include important information such as age, breed, diet, medications, advice from your veterinarian or anything else you believe would be helpful. It also helps to include a picture, especially when asking about skin or coat problems. Every week we will select questions to be answered by our Vet. If you need an urgent response, we suggest using this online veterinary service that has Veterinarians standing by 24 hours a day.